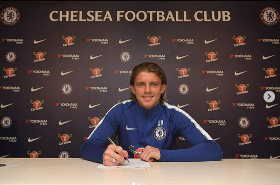 England youth international Conor Gallagher has committed his future to Chelsea by penning a new deal with the Premier League side. Gallagher would have walked away from The Blues as a free agent at the end of the 2018-19 campaign if his contract was not extended. Born February 6, 2000, the Epsom native has been training with Chelsea since the age of six and made his debut for the U18s three months before penning a scholarship. He was a member of the Young Lions squad that won last year's FIFA U17 World Cup, featuring in matches against Mexico, Iraq, United States and Spain. After the tournament in India, Gallagher was promoted to England U18 squad and helped the Young Lions beat Qatar 4-0 in his debut game in March 2018. This season, the central midfielder has represented Chelsea in the Premier League 2, EFL Trophy and UEFA Youth League.